Chameleon Girl, aka Yera Allon of Durla. Created by Paul Levitz and Keith Giffen. Yera--I'm going to call her Yera--spent most of her history not as a Legionnaire but as a supporting character. She was a spy who infiltrated the Legion of Super-Heroes in disguise as Shrinking Violet. In this capacity she fell in love with, and married, Colossal Boy, and they remained married even after Yera had been revealed as a spy and the real Violet rescued. Yera was an actress of some renown; she used her Durlan shapeshifting abilities as part of her acting career. It was strongly implied that she wasn't as adept a combat shapeshifter as Chameleon Boy, but it's possible that her skill at imitating specific individuals was greater. 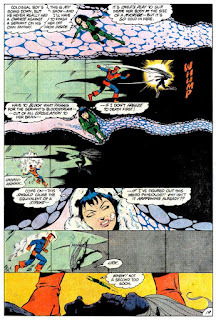 Original Legion continuity ended with Yera and Colossal Boy still married and Yera not a superhero, but in the retroboot she volunteered to become Chameleon Girl, Legionnaire, for a dangerous mission when Chameleon Boy was unavailable. Later, she and Colossal Boy's marriage broke up, and Yera was stranded in the 21st century as part of the Legion Lost series. I liked Yera best as a supporting character. She was great: a Durlan actress who had priorities of her own that had nothing to do with the Legion, but who was married to a Legionnaire? It was good stuff. Just the sort of supporting cast that any superhero title needs. As such I think it was short-sighted for Geoff Johns to turn her into just another superhero in the retroboot; exactly the kind of unsubtle pandering retcons that characterized Johns's contributions to the retroboot. If and when the Legion returns to comics, I certainly would like to see Yera come back with them... but I hope she gets to be herself. 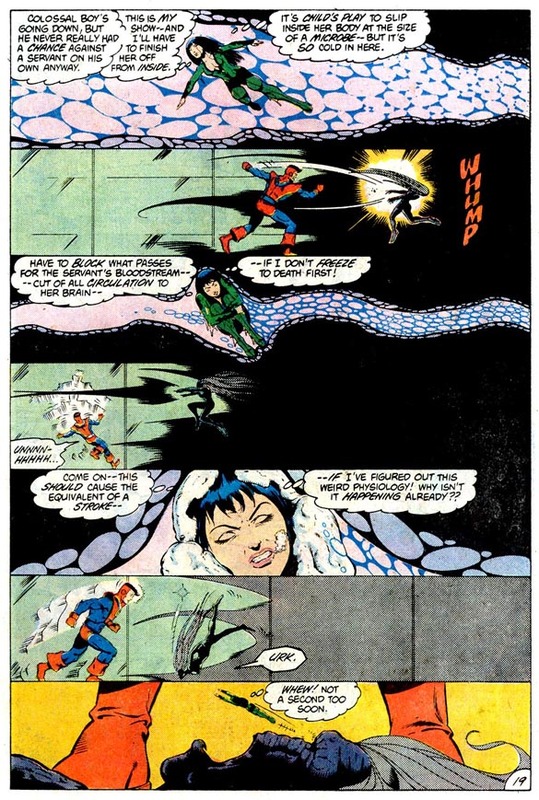 Let's use this as Yera's big moment: she defeats one of Darkseid's Servants of Darkness more or less all by herself! And we didn't even know it was her!